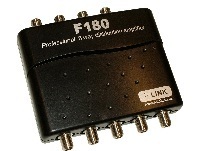 The F180 amplifier/splitter has been designed to supply up to 8 additional tv points in your home.It comes with a 12 volt 500 milliamp power supply along with a comprehensive instruction guide. The F280 amplifier/splitter has been designed to supply up to 16 additional tv points in your home. It comes with a 12 volt 500 milliamp power supply (P700074) along with a comprehensive instruction guide.